An attractive cafe in downtown El Vedado with interesting proposals of Cuban and international cuisine. Here you can taste delicious varieties of chicken, pizzas,very well served burgers, and salads always with fresh vegetables. The atmosphere of the place and the presentation of the dishes are make us predict that you will leave very satisfied. 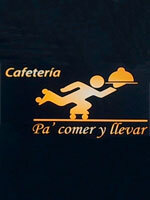 Pa comer y pa llevar is a place where you choose how you want to eat rich!